With our newsletter you can always remain up to date with our latest events. Schloss Prielau was first documented in 1425, with a Christian Glaser zu Prielau named. In the 16th century the castle was rebuilt and gained the design it keeps today. Over the following centuries, Schloss Prielau changed owners many times. The last prince bishop to use the castle was Sigmund Christoph von Zeil and Trauchburg. His emblem can still be seen today at the castle gate. In 1932 Gerti von Hofmannsthal, the widow of Hugo von Hofmannsthal, bought the estate and restored the castle. In the Second World War the family was dispossessed and sculptor Josef Thorak was able to acquire the castle. After the war the Hofmannsthal family then had their estate returned. In 1987 the Porsche family bought the property and converted the castle into a hotel. Since 2004 the castle has been managed by Anette and Andreas Mayer, who treat guests at the hotel and Mayer’s gourmet restaurant. Since 2004 Anette & Andreas Mayer have been hosts at Schloss Prielau. 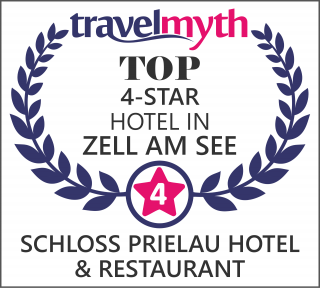 Together with their team of long-serving staff they treat the guests at the hotel and restaurant of Schloss Prielau. Anette Mayer is the heart and soul of the hotel and looks after the guests with plenty of charm. Anette particularly enjoys weddings and celebrations at Schloss Prielau, which she plans and provides support for with plenty of love for detail. Along with his kitchen team, her husband Andreas Mayer, a student of Eckart Witzigmann, spoils visitors to the gourmet MAYER’s Restaurant at Schloss Prielau. The multi-award winning restaurant has, among other accolades, two stars from the Michelin Guide, 3 toques/17 points from Gault Millau and was chosen as "Top 20 chef Austria 2015". All prices listed on the webpage are in EUR and are subject to changes. The general term of hotel contract applies as legal base. The content of this website is protected by copyright. Use of content and image material from this website on other websites is only permitted with the express permission of the editor. The details contained on this website were compiled to the best knowledge and checked with great care for accuracy. Nonetheless it is not possible to fully preclude factual and textual errors. Schloss Prielau does not assume any guarantee or liability for the accuracy, relevance and completeness of the information provided. All details are without a guarantee. This applies also to all links to other URLs featured on our website. This website uses Google Analytics, a web analysis service of Google Inc. (Google). Google Analytics uses so-called cookies, text files that are saved on your computer and allow for an analysis of your use of the website. The information generated by the cookies about your use of this website will generally by transferred to a Google server in the USA and saved there. In the case of an activation of IP anonymisation on this website, your IP address will, however, first be abbreviated by Google within a member state of the European Union or in another country that is a contracting party to the Agreement on the European Economic Area. Only in exceptional cases will the full IP address by transferred to a Google server in the USA and abbreviated there. On request of the operator of this website, Google uses this information to evaluate your use of the website, compile reports on website activities and render services related to website use and internet use for the website operator. The IP address transmitted by your browser as part of the functioning of Google Analytics will not be added to other data from Google. You can block the saving of cookies with a setting on your browser software – please note though that in this case it may happen that not all functions of this website can be used in full. Furthermore, you can block Google gathering the data generated by the cookies on your use of the website (including your IP address) and processing this data - by downloading and installing the browser plug-in available on the following link (http://tools.google.com/dlpage/gaoptout?hl=de). More information can be found on http://tools.google.com/dlpage/gaoptout?hl=de and via http://www.google.com/intl/de/analytics/privacyoverview.html (general information on Google Analytics and data protection). Please note that the code gat._anonymizeIp(); has been extended for Google Analytics on this website to ensure an anonymised gathering of IP addresses (so-called IP masking). If you contact us via contact form your data from this form as well as the data you specify in this form will be secured in our system. Same goes for the transmission of your data via telephone or mail. You agree to this by clicking send on the form as well as the notification of your data via telephone or mail. Your data can be used for direct marketing (newsletter). You are not forced to let us use your data and can cancel the use at any time via email or just unsubscribe our newsletter. The closest train station is located in Zell am See and is just 5 km away from Schloss Prielau. We recommend Salzburg Airport, which is just 70 km away from the schloss and is one hour’s drive away. Munich Airport is 200 km away. We will gladly organise a transfer for you! If arriving with your own Learjet, Zell am See airport is available. We will gladly obtain a landing permit for you there. For arrivals with a helicopter, our heliport right next to the schloss is available. You can fly from Salzburg to the schloss in just 20 minutes. Helicopter transfers can be organised and booked by our staff. If planning your own arrival by helicopter we ask you to please inform us in advance. Schloss Prielau is located in idyllic grounds, just 200 metres from the north shore of Lake Zell. The former residence of writer Hugo von Hofmannsthal’s family was first documented in 1425. Since 1980, Schloss Prielau has been owned by the Porsche family, who converted it into a country hotel for lovers of the Austrian hospitality and cuisine. Anette and Andreas Mayer have been your hosts since 2004 and spoil hotel guests and visitors to MAYER’s gourmet restaurant with plenty of love and personal care. They have seven double rooms, two suites and an apartment in the fishing lodge available. The rooms were renovated with lots of love in December 2017. They are furnished in a luxury rural style yet possess all the technical comfort of a boutique hotel. Sleep comfort on the highest level, finest textiles and tasteful accessories, modern baths and - quietness. Delicious breakfasts are served in the cosy castle kitchen, where you can also while away the lunchtime and the afternoon. On the terrace, with its view of the castle grounds, you can enjoy the sun and the tranquillity while you watch the on-site deer. In the rustic bathhouse you can relax with a visit to the sauna and steam bath or treat yourself to a massage. Thanks to the unique surroundings and dreamlike location, Schloss Prielau is the perfect venue for your wedding or family celebration for up to 300 people. I think of you, of my castle, of my Prielau. Monday until Sunday: 11.30 a.m. until 6.00 p.m.